Users who have installed PC Defender 2008 are advised to remove this clone fake security application as soon as possible. On the surface, PC Defender 2008 claims and promotes itself as an anti-spyware security program that is able to scan and detect spyware, malware and other security problems. It offers online scanning to users. 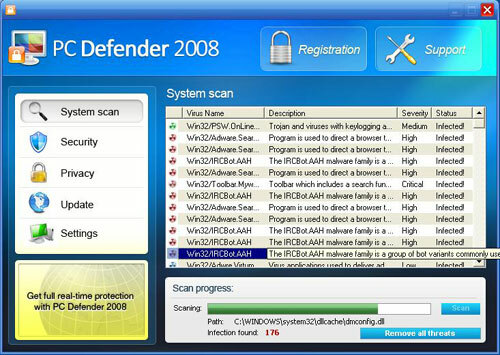 After scanning, it will alert users that their computer is infected by viruses and convince users to download and install the trial version of its PC Defender 2008 as a security solution. However, in fact this anti-spyware software is in fact a fake security application. The application itself is a high risk malware which will continuously dupe users with deceptive warnings or false scan results to confuse users that their computers are infected with various viruses. Users will be flooded with warning messages such as “Critical System Error”, “Critical System Error”, “Hijacked homepage to obscure webpage”. Flashing icons appear on your system tray (Near your system clock), etc. It will thence slowly mislead users to purchase its software. PC Defender 2008 is an extremely high risk malware. Besides annoying users with false security alarms, it can severely compromise the security of users’ system. For instance, it can disable other security software, modify system files, open illicit network connections, use polymorphic tactics to self-mutate, self install other malware and steal users’ personal identifiable information.